Close to the small New Zealand town of Kaikoura, the Kaikoura Canyon creates a unique opportunity for researchers to study sperm whale populations due to its proximity to the New Zealand coast. Just over a kilometre away from a mountain range with peaks over 2200 metres, the Kaikoura Canyon plunges to 1000m depth, and it connects with the Hikurangi Trough which itself connects to the Kermadec trench, one of the deepest places on Earth at over 10,000m deep. It is this deep water environment which has attracted and sustained a resident population of giant sperm whales which is present all year with visiting seasonal populations. It has made the little town of Kaikoura a favourite tourist spot for whale and dolphin watchers with daily tours departing to see these magnificent creatures. It has also allowed researchers to conduct studies on whales and other marine species for the past 30 years. 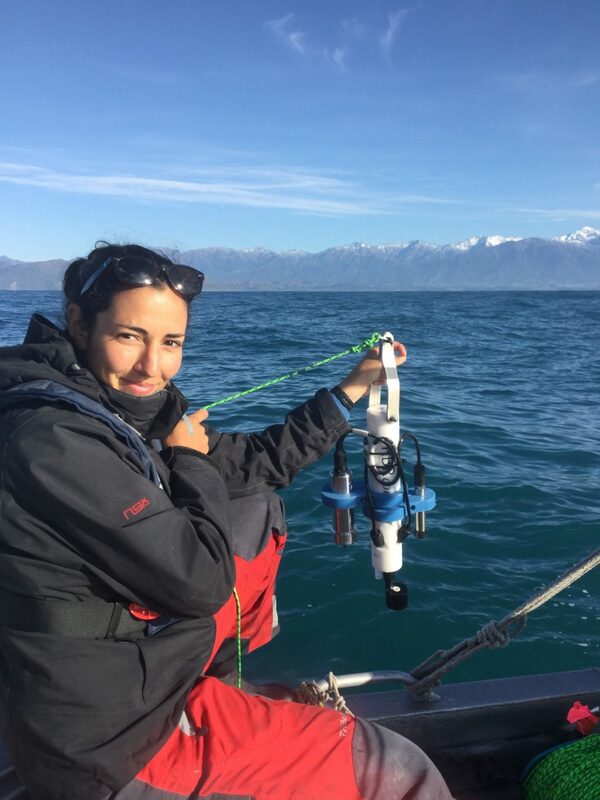 Marta Guerra is one such researcher, who, for three years has been gathering oceanographic data, collecting samples and chasing after the giant (up to 16m long) sperm whales of the Kaikoura trench. After feeding on giant squid in the deep canyon off Kaikoura, sperm whales surface and spout very close to land. Marta and her team, armed with a directional hydrophone aboard a small zodiac listen for the characteristic “clicks” as the massive predators use echolocation to find their prey. Gradually, Marta hones in on their position. Once close, they set up and wait for the sperm whales to surface between dives. Marta’s team positions their little boat astern of the whales and records data such as surface time and position, collects sloughed skin left by the whales (a kind of natural anti-fouling) and waits for the dive to snap an identification photo. Marta’s research for her PhD from The University of Otago involves investigating the food webs and feeding habits of the sperm whales. The entire Kaikoura Canyon is a feeding ground but some areas are well frequented while others are patchy. Looking for differences between, and characteristics of these more and less hunted areas is one aspect of her research. By using stable isotope analysis of the sloughed whale skin, together with analysis of the potential feed in the area, she is able to obtain a picture of what the whales are feeding on. Whale numbers in Kaikoura have been dropping over the past two decades and trying to identify why this has occurred is part of the challenge. Fine-scale data, collected from a small boat while chasing giant sea creatures is challenging work, but Marta has a lot of questions to answer: “What makes good habitat and foraging conditions for sperm whales in the Kaikoura canyon? Once we were in position close to the feeding whales we would also measure oceanographic parameters, seafloor depth and slope, chlorophyll, temperature gradients, and thermoclines as well as salinity to gather fine-scale data”. Part of that work involved many many casts of the RBRconcerto CTD. With the data collection phase of her research now complete (three winters and three summers out on the water) Marta is currently writing up her findings.